← How Can Probiotics Benefit You? The basic building blocks of a healthy, nutritious diet consists of carbohydrates, proteins, fats and lest we forget, water. By choosing the healthiest forms and proper balance of each of these foods, you enable your body to function at an optimal level. One other necessary and very important part of a healthy balanced diet is fiber. Naturally occurring fiber is found only in plant-based foods and is actually the part of the plant that is resistant to the digestive process. As a result, only a small percentage of fiber is metabolized. The bulk of fiber passes through the intestines undigested, aiding bowel health and providing critical support for colon function. A diet that includes a wide variety of high-fiber foods provides celluloses, lignans, pectins, oligosaccharides and other fibers and consequently, a greater amount of health benefits. Basically, fiber can be typed as soluble or insoluble. Soluble fiber disperses in water and has a high water holding capacity, becoming gelatinous as it travels through the digestive tract. Soluble fiber aids in reducing cholesterol levels and helps to slow glucose absorption, thereby helping to stabilize blood sugar levels. Insoluble fiber does not change form, tends to prevent constipation and speeds up the rate that food passes through the digestive system, stabilizing colon pH levels, eliminating toxins and providing valuable protection against colorectal cancer. Many plant-based foods will contain both soluble and insoluble fibers. 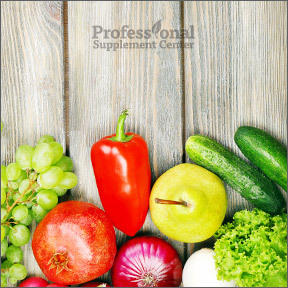 Raw vegetables, fruits, nuts, legumes and 100% whole grains all contain good amounts of health promoting dietary fibers. Unfortunately, the typical American diet is lacking in fiber and, according to The Journal of Nutrition, current fiber intakes are alarmingly low. So low, in fact, that inadequate fiber intake has become a public health concern, as low fiber intake is associated with risk factors for many highly prevalent and preventable chronic diseases, including cardiovascular disease, metabolic syndrome, inflammation, obesity and type 2 diabetes. While some clinicians and nutritionists feel the recommended fiber intakes of 38 grams for men and 25 grams for women are too low, The Institutes of Medicine reports that only 3% of Americans are consuming adequate amounts of fiber and that the average consumption is only half of the recommended amounts. With two-thirds of American adults overweight yet undernourished, current dietary guidelines support increased consumption of nutrient-dense and fiber-containing foods along with decreased consumption of refined and processed foods. With the Centers for Disease Control and Prevention (CDC) reporting that only 33% of adults meet the RDA of 2 servings of fruits and 27% meet the RDA of a minimum of 5 servings of veggies, those who wish to achieve optimal intakes would require considerable behavior and dietary changes. Fiber’s role in promoting health is often overlooked. While short term benefits, such as constipation relief, are indeed helpful, the long term benefits of increased and adequate fiber consumption include reduced cardio-metabolic risks, sustained weight control and lowered daily glucose levels, especially for diabetics. The first challenge to achieving recommended daily intakes requires a careful selection of foods. Realistically, consumers can increase their fiber intake by switching from refined grains to whole grains, opting for whole grain cereals and increasing legume, vegetable and fruit consumption. According to the CDC, getting fruits and vegetables from farms to consumers is challenging but huge efforts are underway on a state-by-state basis to increase the availability of affordable, healthier food choices. As whole foods provide nutritive benefits in addition to fiber, increasing the intake of nutrient dense whole foods is optimal. For those who do not reach the RDA of fiber through diet alone, supplementation that includes both soluble and insoluble fibers is a great way to promote the wide-ranging benefits of increased fiber intake. In order to meet individual needs or preferences and simplify supplementation, supplemental fiber is available in a variety of forms, which can include psyllium, flaxseeds, beta-glucans, inulin, celluloses, and oligofructans. Psyllium is a good intestinal cleanser, laxative and stool softener. Cellulose helps relieve constipation and removes cancer-causing substances from the colon wall. Lignans help to lower cholesterol and provide support for cognitive function, especially in postmenopausal women. Pectins help to remove toxins, lower cholesterol and reduce the risks of heart disease, while glucomannans assist with weight control and aid in normalizing blood sugar, cholesterol and triglyceride levels. If you are taking prescription medications or have diabetes, be sure to check with your healthcare practitioner before starting on a fiber regimen. To avoid interference with the absorption of certain medications, do not take fiber supplements at the same time as medications. Organic Triple FiberMax Powder by Advanced Naturals – Formulated with 3 types of 100% organic fibers to promote regularity, support cardiovascular health and help lower cholesterol, this quality product contains organic flaxseed, oat bran and acacia fiber. No additional ingredients. Fiber Plus Caps by Ortho Molecular – This natural fiber supplement contains organic psyllium powder, rice bran, apple pectin, fig, and prune plus probiotic lactobacillus acidophilus in support of healthy bowel function, regularity and long term bowel maintenance. Gluten free formulation. Fiber Formula by Integrative Therapeutics – Formulated with both soluble and insoluble fibers, this product supports colon health, aids in toxin elimination and promotes regularity. Wheat, dairy and soy free formulation. MediBulk by Thorne Research – This powdered formula contains soluble and insoluble fibers in support of optimal digestive health, toxin elimination and maintenance of normal cholesterol and blood sugar levels already within the normal range. Gluten, soy and dairy free formulation. Balch, Phyllis A. CNC. Prescription for Nutritional Healing. Penguin Group, 2010. Guilliams, Thomas G. Ph.D. Supplementing Dietary Nutrients. Point Institute, 2014. This entry was posted in Home and tagged Dietary fiber, Fiber, Fiber Formula by Integrative Therapeutics, Fiber Plus Caps by Ortho Molecular, MediBulk by Thorne Research, Organic Triple FiberMax Powder by Advanced Naturals, Professional Supplement Center, Vitamins and supplements, www.professionalsupplementcenter.com. Bookmark the permalink.